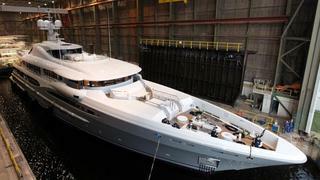 Yesterday was the day of the delivery of the first Amels Limited Edition 212. The yacht, named Imagine, left Vlissingen at the end of the afternoon. Already mentioned in this column on 1st December 2010, the 65.5m superyacht is arriving in Southampton this morning on her way to the Mediterranean. Also reported is the launch of the second Amels Limited Edition 177 few days ago. Readers may recall we reported her sale on 7th October 2010 in our brokerage news. Currently known under the hull number 458, the 54.3m superyacht has an exterior design by Tim Heywood, while her interior is by Laura Sessa Romboli. It accommodates 12 guests in six staterooms: a master suite plus three double and two twin cabins. On the technical side she's powered by twin MTU 2000 M70 engines giving a top speed of 15.5 knots, a cruising speed of 13 knots and a range of 4,500 nautical miles. Her delivery should take place this Summer.